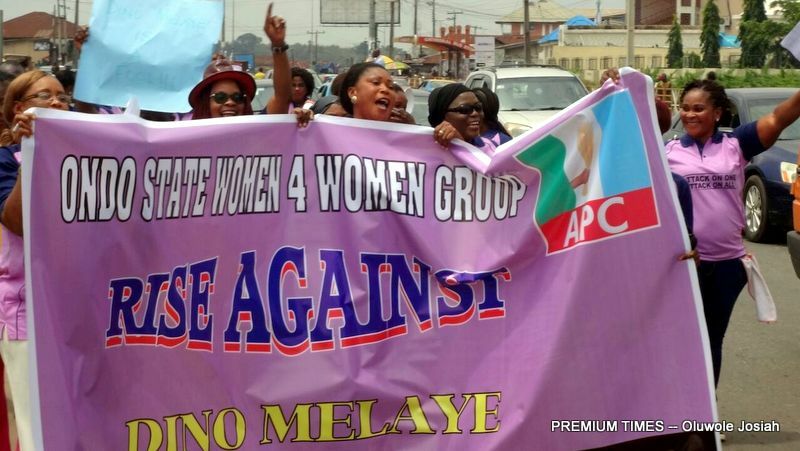 A women group, Ondo Women for Women, on Monday marched through the streets of Akure, the Ondo State capital, in protest of what it described as assault on Oluremi Tinubu, a Lagos senator, by her colleague in the Senate, Dino Melaye. 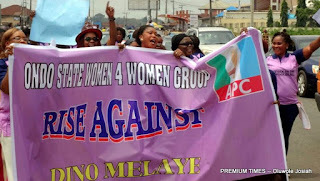 The group, which is an arm of the All Progressives Congress in Ondo State, said the attack on Mrs. Tinubu by Mr. Melaye during an executive session of the Senate was an attack on Nigerian women. They went around the streets chanting solidarity songs and brandishing banners with inscriptions against Mr. Melaye. Briefing journalists after the March, the leader of the group, Olaseinde Vincente, said Mr Melaye had records of assaults and physical attacks on women who either were in romantic relationships with him or in working relationship with him. “He threatened to beat up Senator Remi Tinubu at the Senate Executive Session and boasting that nothing would happen after carrying out such action,” she said. “We not only find this action of Melaye appalling, this shameful behaviour of the Senator from Kogi west shocked us the entire Nigerian women. Mrs. Vincent said if Mr. Dino Melaye wanted to flex his muscles, he was free to do so but not by bullying a fellow senator at the senate hallowed chambers. “Melaye’s excesses and uncontrolled anger towards women should be nibbed in the bud before it gets out of hand,” she warned. “How would anyone imagine any reasonable man could intimidate a woman who spoke in candour at a Senate Executive Session and whose comment at the meeting was laced with utmost decorum. She said the women group would not allow Melaye’s assault on women go unpunished. “It is on this note that we condemn in its entirety the barbaric behaviour of Mr. Dino Melaye, a Senator who misrepresented the good people of Kogi West Senatorial District in the National Assembly at the Executive Session meeting of the National Assembly on Tuesday, 12th of July, 2016,” Mrs. Vincent noted. Mr. Melaye had admitted insulting Mrs. Tinubu after she called him a dog and a thug. He also vowed not to apologize for his actions, saying his political future could not be determined by the APC national leader, Bola Tinubu, who is Remi’s husband.